For over 30 years our firm has specialized in automotive illustration and car-related illustrations created for automobile manufacturers and suppliers of all types. Throughout the decades, our artwork has been used in both national and international advertising campaigns, promotional and marketing materials, point-of-purchase dealer displays, industry trade shows, auto dealership brochures and collateral print media a wide variety of business sectors, primarily focusing on cutaway automotive art. 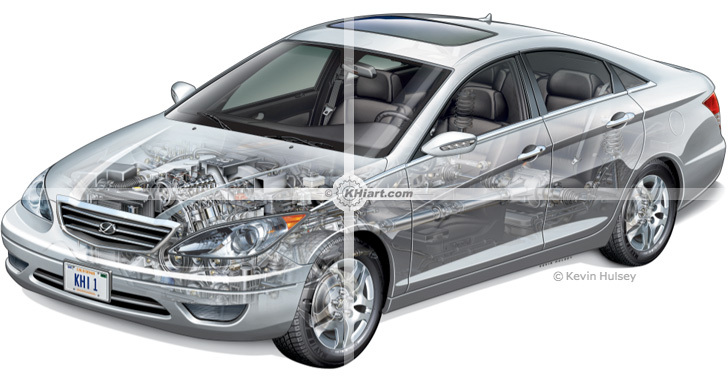 We also have a substantial library of over 1,000 technical and automotive stock-images available for license, including technical illustrations of cut away automobiles, car exterior automotive illustrations, engine and transmission cutaways, car photos and other vehicle or machinery-related product technical images. All Images Copyright © 1994-2015 KHI and AutomotiveIllustrations.com, all rights reserved.